To describe Tempelhof Airport as a large building would be like describing the Egyptian pyramids as a bunch of sandcastles. 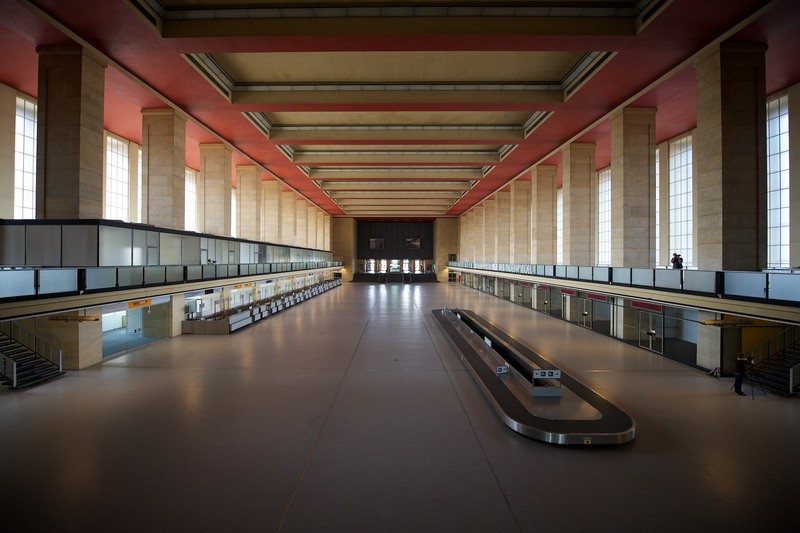 When construction was halted in 1945 Tempelhof was already one of the largest buildings in the world, despite being barely a third complete. The original design featured a set of crescent shaped terraces which would ultimately accommodate one million seated spectators in a gigantic amphitheater surrounding the airfield. As it stands today the vast flat roof is big enough to support 300,000 people, accessible via two stairwells each with a bandwidth of 100,000 people per hour. That’s the population of Nottingham, on the roof. The rug matches the curtains. A vast labyrinth of secure storerooms and blast-proof bunkers provided air raid shelter for the airport workers and their families, younger members reassured by familiar illustrations from Wilhelm Busch’s cautionary tales. But it’s not all murals and Moritz; three storeys of cellars were dedicated to the storage of the Third Reich’s film archive, whose celluloid inflammability made it a precious if dangerous collection. Soviet forces discovered just how dangerous when they used copious amounts of explosives to open those defiant iron doors – the resulting fire burned for three days and comprehensively destroyed the entire collection and much of the ceiling. To this day we’re not sure exactly what was down there. Tempelhof played a pivotal role once Germany had been divided up following the end of World War II by forming one end of the »Luftbrücke« and allowing Allied planes to drop supplies onto the citizens of West Berlin, marooned on their island in an extensive Communist ocean. Today the airport is being kept alive through a variety of uses; Berlin businesses rent storage space, photographers roam the immaculately preserved baggage halls and US Army recreation areas, and citizens relax with barbecues and rollerblades on the runways.